Two years ago, GIO completed a review of the Official Plans of Ontario municipalities. We found that 18 of 93 (19%) plans examined had included the term ‘green infrastructure’. This summer, we reviewed the same plans to see if there have been any significant changes. Why does it matter if green infrastructure is mentioned in Official Plans? An Official Plan describes upper, lower or single–tier municipal council’s policies regarding how land in a community should be used. The plan is prepared with input from the community and helps to ensure that future planning and development will meet the specific needs of the community. Depending on how the term is included in the Official Plan, the inclusion of the term green infrastructure can allow municipalities to promote the use (and associated co-benefits) of green infrastructure in future developments. 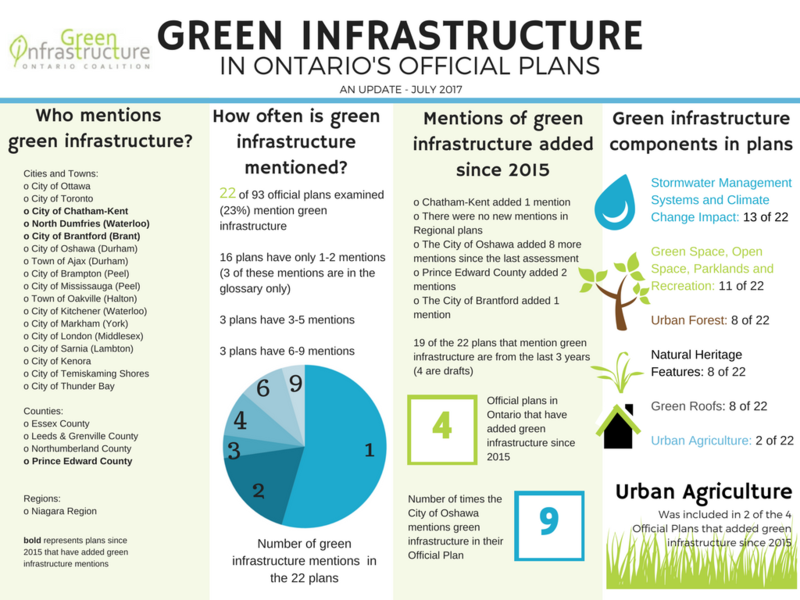 The number of Official Plans in Ontario that mention green infrastructure has grown to 22 of the 93 plans we looked at (24%). This 5% increase is attributed to the jurisdictions of Chatham-Kent, North Dumfries, the City of Brantford and Prince Edward County. Another interesting observation is that Chatham-Kent and Prince Edward County are the first jurisdictions that mention urban agriculture in addition to green infrastructure. It is encouraging to see that the City of Oshawa expanded the use of green infrastructure in their Official Plan, adding 8 more mentions since 2015. This is the most frequent use of the term in any plan we have seen yet. Niagara Region remains the only regional municipality to include the term green infrastructure in their Official Plan. We know many regions are doing great work when it comes to green infrastructure; inclusion in their Official Plans is a natural next step. Green infrastructure can often provide greater benefit when there is connectivity between its various components (e.g. LID connected to wetlands). Planning at a regional scale could help improve the connectivity of green infrastructure across our communities. Three of the plans mention green infrastructure only in their glossary, with no direction associated with the mention. In order to support green infrastructure in a meaningful way, Official Plans should explicitly reference the contribution that green infrastructure can make to their planning goals, such as stormwater management, climate change adaptation, food security etc. With Ontario’s expected Asset Management Planning Regulation, municipalities may soon be required to consider green infrastructure as an option as part of their lifecycle management strategy. We hope to see more jurisdictions including green infrastructure in their Official Plans, particularly now that it is eligible for infrastructure funding.